Omaha and Texas Hold'em are currently the two most popular poker games in the world, both in live casinos and at online poker sites. They are both actually forms of "Hold'em", meaning that in each game the players have hole cards that they combine with community cards to make the best five card poker hand. The games are similar in structure, as the only real difference is that in Texas Hold'em you receive two cards and can use any combination of those cards and the five community cards, and in Omaha you receive four hole cards and have to use two of your hole cards with three community cards (Learn more about Omaha Poker Starting Hands). Also, Hold'em is always played in a High format, but Omaha is often played in a High/Low split game. There are tons of similarities between Texas Hold'em and Omaha Hold'em. The main difference is the fact that both games have	hole cards that are used in combination with community cards. Also, the structure of the games are exactly the same - players receive cards, bet, see the flop (the first three community cards), bet again, see the turn (fourth community card), bet again, see the river (last community card), bet again, and have a showdown. The main difference between Omaha and Texas Hold'em is the number of hole cards you receive, and how you can use them. In Texas Hold'em you receive two hole cards, and can use one, both, or none to make the best five card poker hand. In Omaha you receive four cards, and must use two of them. For example, if you have a hand of 2-3-4-5 and the board is A-K-K-8-7, contrary to popular belief you do not have an Ace-Five straight. Your best hand would be K-K-A-5-4 because you would have to use the four and five from your hand. The most noticeable difference between Hold'em and Omaha is the relative hand strength for each game. In Hold'em you'll commonly see hands like a pair of Aces or two pair winning at showdown. However, when you play Omaha you'll notice that winning hands at showdown are more commonly flushes, straights, and full houses. 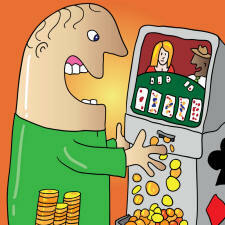 The main idea is that you shouldn't treat top pair or even two pair the same in Omaha as you would in Hold'em. Another big difference between Hold'em and Omaha is the fact that Omaha is often played in a High/Low version of the game, while Hold'em is always played in the High version. If you end up in a high/low Omaha game, make sure to remember that the pot is actually split in half - there is a High pot and a Low pot. To learn more about Omaha high/low, read our Introduction to Omaha Hi-Lo. In Hold'em draws are fairly common, but in Omaha they are a hugely important part of the game. Since each player has four cards major draws will be much more common, so if you have a made hand on the flop you need to bet it extremely hard to try to defend your hand.